Customer can view or track their order, as well as see their past order history by visiting the My Orders page. Please note that a login will be required. Orders received prior to 1:30 PM Eastern Standard Time will be processed within the same business day provided that the goods are in stock and customer identification is verified. To ensure that orders placed online prior to 1:30 PM EST will ship the same day, please review our “Payment Methods” section below and double check product availability with Watch My Diamonds customer service. After hour, weekend, and holiday orders will be processed the next business day. After an order is placed, the customer will receive an order confirmation via email. If there are any discrepancies with your order please contact Watch My Diamonds as soon as possible to correct the issue. When the order ships, a shipment tracking number will be provided to the customer via email. To track your package, please refer to the My Orders page. Please note that a login will be required. Because, we are always striving to ship orders as quickly as possible, there is a limited amount of time during which we can modify or cancel your order. If you would like to attempt to modify or cancel your order, please e-mail us at orders -------.com and include your order number and change/cancellation request or visit our Customer Service center to request the same. Note: Orders placed through any company other than Watch My Diamonds cannot be altered. For example, shipping address changes can only be made for orders placed directly through Watch My Diamonds. We will respond to your request to let you know if we were able to modify or cancel the order. Please note that if you did not receive a reply from Watch My Diamonds then your request to modify or cancel the order has not been effected. Watch My Diamonds will gladly pay for free Ground shipping for every order valued over $100 via UPS or USPS depending on the order. However, should you return an item, the cost of shipping will be deducted from your total refund. Every item shipped out of our warehouse is fully insured by UPS or USPS. Orders outside the 48 continental States require Second Day or Next Day Air service. APO or FPO address requires United States Postal Service Shipment (USPS) Option. Delivery time via Ground can range from 1 to 6 business days. Please view the provided map for transit time estimation. All items are shipped insured. Note that air and ground shipping times are measured in business days. Next Day Saturday delivery option is available only in the United States. 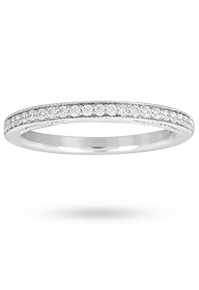 Watch My Diamonds provides insurance coverage for every item we ship out. You may be asked to sign for the package upon delivery. Orders destined for delivery in the United States, however outside of the 48 Contiguous States (eg; Hawaii, Alaska, APO and FPO addresses) will be shipped via ground delivery. APO or FPO strictly require us to ship via the US Postal Service. If a shipped order was lost or damaged, UPS or USPS must conduct an investigation. Please contact Watch My Diamonds to initiate a tracer within 10 business days of the item shipping from our warehouse. If the package is not located, UPS and USPS will process a claim for the package. Claims can take two weeks to process. When the carrier claims responsibility for the loss or damage of your shipped item(s), insurance reimbursement will be issued to Watch My Diamonds and the replacement item(s) will be shipped out. If the item(s) is no longer available, and a similar item is not wanted, Jomashop will gladly refund your original payment. When your order is received, if there are any noticeable discrepancies with your item, or if the item is different than what was ordered, please contact Watch My Diamonds within 5 days of receipt of your shipment to make any necessary corrections. Please read our International Orders section below for International shipping problems. If the item received is different than what was ordered, please contact Watch My Diamonds within 5 days of receipt of your order. If you believe that your automatic watch isn't working properly, please click here for more information. Product discrepancies not notified to Watch My Diamonds within 5 days may not be honored for replacement. Please contact us within 5 days of receipt of your shipment if your item is defective. Note: Errors or omissions in descriptive, typographic, pricing and/or photographic representation are subject to correction. In the unlikely event that goods are received with damaged packaging, such as outer boxes, cases, instructions, manuals, etc. Watch My Diamonds reserves the right to replace the original packaging of products sold herein. Watch My Diamondscannot guarantee a replacement of the manufacturer’s original packaging. International orders can be processed online and paid with Visa, MasterCard, or American Express. Watch My Diamonds will also charge a processing fee for all orders containing an international shipping address. This charge will be calculated during checkout and combined with the shipping charges for all international shipping addresses orders. All online international orders are verified through the Watch My Diamonds payment system to accommodate our International cardholders. Please note that your order may be subject to additional verification of address or product availability. If more information is needed, you will be contacted by a customer service representative shortly. You will receive a second email as soon as your order has been verified and processed. To expedite the processing of your order, please be available at the phone number or email address you provided so that we are able to contact you. If our verification department is unable to reach you, your order may be delayed. If your order is not approved you will be notified of your cancelled order status via email. In addition to credit card payments, Watch My Diamonds also accepts international orders via wire transfer. Wire transfer orders must be submitted via email and processed manually. When sending Watch My Diamonds an international wire transfer payment, please make sure to pay all fees associated with your wire transfer (contact your bank for fee details). Watch My Diamonds will email you a list of wire transfer instructions after an invoice is generated in our system, and an order total is confirmed. If an International order is received damaged or not received at all, an insurance claim must be initiated and finalized before customer compensation or product replacement is executed by Watch My Diamonds. If the item is received damaged, please contact Watch My Diamonds within five business days of delivery to conduct a claim. Please hold onto your shipping box as our insurance company may want to inspect it. If the item is not received at all we are required to wait 45 days after the shipment date to conduct an insurance claim. If you are not satisfied with your purchase, you may exchange or return it for a refund (excluding shipping and handling charges) within 30 days from shipping from our warehouse, subject to a Return Merchandise Authorization from Watch My Diamonds. Remember, the cost of shipping will be deducted from your total refund. A return merchandise authorization number can be requested by clicking on the Return Request Form, please see our note below regarding Special Orders. All purchases, accessories, serial numbered security tags (if provided), and packing materials must be in new condition to avoid refusal of the returned merchandise or restocking fees. All returned or exchanged items must be in new condition, in their original packaging, and must include all packing material, blank warranty cards, manuals, and accessories. Any signs of wear or removal of parts, will result in refusal of your return. Please Note: Any item purchased with diamonds is available for an exchange of a substituted customized purchase of equal or greater value. If when you receive your purchase, there are any noticeable discrepancies or damages, or if the item is not what was ordered, please contact Watch My Diamonds within 5 days of receipt of your shipment to make the necessary corrections. If a return shipping label is provided via email, please print the label and tape it to the shipping carton. We do not reimburse or refund shipping charges if a third-party shipper is used, such as Mail Boxes Etc. or Postal Annex. In order to return an item you need to first obtain an RMA (Return Merchandise Authorization) number. To request an RMA number online, please go to the Return Request Form. Issuance of an RMA number does not guarantee final disposition and all returns are subject to inspection. RMA numbers are valid for ten days. The RMA number must be clearly written on the shipping carton to prevent refusal. If an order is shipping via ground shipping, the initial shipment fee incurred by Watch My Diamonds to ship the merchandise will be deducted from the refunded amount. Please be advised that select items sold on Watch My Diamonds are considered a "Special Order" and subject to a Limited Return Policy. A "Special Order" may include but not limited to items that we do not have in our warehouse, items that are customized, items that we do not have on our website which are special ordered from our distributor, and/or all orders that have a sale price equal or greater than $4000. The return of these items/orders will have a restocking fee of 8% or Final Sale policies unless otherwise agreed by the Watch My Diamonds staff via mail, fax or e-mail. Watch My Diamonds is proud to accept Credit cards, Paypal, Pay with Amazon, money orders, certified bank checks and wire transfers, as well as other options. For speed and security, we recommend that all orders be placed with a credit card. Please provide us with your billing address to which your bank mails your monthly credit card statement. The bill-to address you give us must agree with the address that the card issuing bank has on file. Please be sure you provide the correct information, even if the items are to be shipped to a different location. We regret that this is necessary, but it is designed to protect the card owner as well as the retailer. Orders are authorized for payment when submitted online and your order will not be charged until it ships out of our warehouse. *Please note Amazon Payments orders are pre-charged before the order is shipped. Please make sure that your billing information submitted to Watch My Diamonds corresponds to the address where your credit card statements are received. This address should also be the same address that your credit card company has on file. If you are not sure of your correct billing address, please contact your credit card company for details. Billing and identity information submitted to Watch My Diamonds that is inaccurate will delay the shipment of your order. If you receive a "declined" error message when your order is placed, you must contact your bank. Jomashop has no control over these error messages; they are submitted from your bank's online authorization system. There are numerous reasons explaining a “declined” message. Usually credit cards have an online spending limit, and you may contact your bank to grant permission for the online transaction. After the bank temporarily lifts this restriction, feel free to order the item online again and proceed to checkout. Watch My Diamonds reserves the right to refuse an order when the address or credit card is not verifiable. Watch My Diamonds accepts direct wire transfers for both domestic and international orders. Watch My Diamonds will deduct 3% off your order total if a wire transfer is used for payment. Wire transfer orders cannot be processed online and must be placed over the phone or email. You will be given an order number and emailed wire transfer details. Wire transfers are recommended for orders placed without access to a credit card. Watch My Diamonds usually receives domestic wire transfers the same business day; international wire transfers about two to four business days to process. Please contact Jomashop.com after the anticipated wire transfer date so we may check our records for your payment. After payment is received, your order will be shipped. To pay for an order with a wire transfer, please contact us. Watch My Diamonds maintains a state-of-the-art, on-site repair watch repair center staffed by professional watchsmiths, horologists and technicians. We provide speedy, on-site service for any watch covered under the terms of our warranty, be it simple battery replacement or a full repair to replace a defective mechanism. Watch My Diamonds success is built around making our customers happy and our professional team is here to ensure that your experience is satisfying. As with all of our merchandise, we offer a hassle-free, 30-day money-back return policy.